Powdered white tea from the Fujian region of China. This region is known to produce many of the world’s finest teas and has perfected it’s craft over thousands of years. Although it is not technically a matcha as it is made from white not green tea, it is powdered and consumed the same way as a typical matcha. 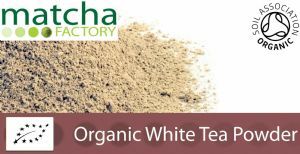 Matcha Factory has been working hard to find this unusual white powdered tea.